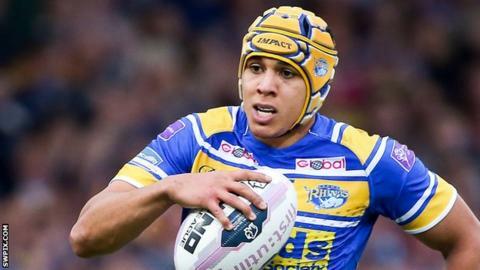 Salford Red Devils have signed winger Ben Jones-Bishop from Super League rivals Leeds Rhinos on a three-year contract from 2015. Rhinos had confirmed that the England Knights three-quarter would be leaving at the end of the season, having made his debut for them in 2008. The 25-year-old has scored 53 tries in 76 games for Leeds. However, the arrival of Tom Briscoe from Hull last winter has limited him to just five appearances this season. Salford owner Marwan Koukash has invested heavily in the Red Devils side, already adding New Zealand full-back Kevin Locke to Iestyn Harris' squad for next term. "Ben Jones-Bishop is somebody who I've admired over the past few years and I don't think I'm on my own in saying that," Harris told the club website. "He will be another terrific signing for this club. We are making signings that will add an extra dimension next season and we look forward to working with him when he joins us after the current season finishes." Jones-Bishop, who overcame a blood clot on his lung that forced him to miss the start of last season, also reportedly attracted the interest of Australian NRL clubs before signing for Salford.